The Knicks have made plenty of bad free agent signings, but which ones were the worst? The New York Knicks shocked the NBA community last week after the club dealt star center Kristaps Porzingis in a trade with the Dallas Mavericks. Trading the bloated contracts of guards Tim Hardaway Jr. and Courtney Lee opened up two potential max contract slots next season. Reports suggest GM Scott Perry and team president Scott Mills have their eyes set on Golden State Warriors star power forward Kevin Durant and Boston Celtics point guard Kyrie Irving. Bringing in two superstars would be a massive coup. However, recent history suggests New York doesn’t have the best luck when dishing out mega contracts. 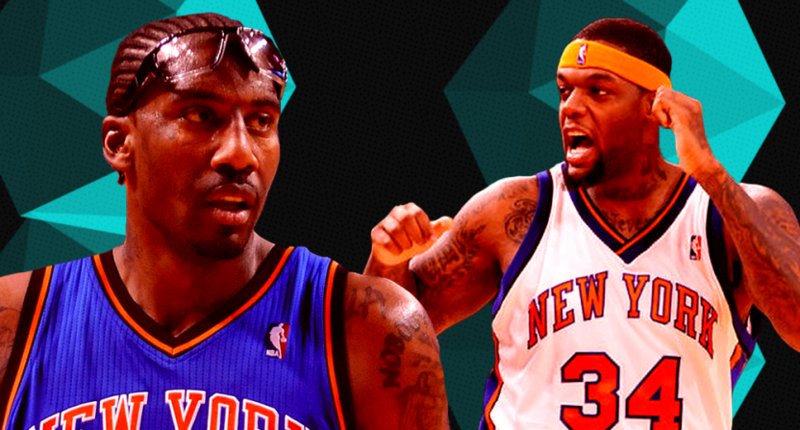 Here are five of the worst contracts the Knicks have ever given to free agents. In desperate need of a center, former Knicks president Isiah Thomas swung for the fences before the 2005-06 season, acquiring Curry in a mega-deal with the Bulls in a trade involving multiple players and first-round picks for the 2001 fourth overall pick. Thomas than inked Curry to a five-year, $60 million extension. While Curry’s time in New York is remembered poorly, Curry actually played okay in his first season and solidly in his second, averaging a career-high 19.5 points and 7.0 rebounds per game. The problem was the Knicks didn’t win and Curry, who battled multiple health troubles before the trade, consistently showed up to camp overweight and dealt with knee issues. By year four in the Big Apple, Curry played just three games. He appeared in only seven in year five. Eventually, the Knicks cut bait with him in the Carmelo Anthony blockbuster trade. Curry would play just 16 more NBA games. The two first-round draft picks the Knicks gave up both fell in the lottery and ended up being center Joakim Noah (more on him later) and forward LaMarcus Aldridge, in case you’re wondering. Thomas must have been super impressed with James after watching him play the best basketball of his career for the Seattle SuperSonics during the 2005 playoffs. James, who’d never averaged more than 5.4 points before breaking out with a 12.5 point, 6.8 rebound per game average that postseason, signed a five-year, $30 million deal with the Knicks. The deal is up there with some of the worst in NBA history. James never came close to matching his 2005 playoff performance, as he warmed the bench during his Knicks tenure, never playing more than nine minutes per game or averaging better than 3.0 points. Not only did James play poorly, but he was out of shape—even getting suspended in 2006 for being unprepared to practice. Thomas bet big time on an extremely small sample size of success in this impressively bad move. James would eventually get dealt to the Bulls and never played again in the NBA after getting waived. The Knicks saw Stoudemire’s production and explosiveness with the Steve Nash-led Phoenix Suns and spent big on the high-scoring forward. On paper, the move made sense. The contract was a success early on, as Stoudemire averaged more than 25 points and took New York to the playoffs in his first season. But over the next four seasons, Stoudemire slowly fell apart. He would miss nearly more games than he ended up playing in as thanks to serious knee issues that the Knicks virtually ignored when signing him. He also had one of the most infamous self-inflicted injuries ever, punching the glass casing on a fire extinguisher during the 2012 playoffs. With his effectiveness and star power dwindling, the Knicks cut bait with Stoudemire in the middle of the 2014-15 season, buying out the remainder of his contract. He’d play 75 more games in the next one-and-a-half seasons with the Dallas Mavericks and Mami Heat. For those hoping he’d retire a Knick when they signed him, Stoudemire didn’t disappoint. He signed a one-day contract with the team in 2016 before stepping away from the NBA for good. Allan Houston racked up a ton of impressive accolades during his NBA career. He was a two-time All-Star with the Knicks and a gold-medal winner at the 2000 Sidney Olympics. After a great few years in New York, GM Scott Layden signed Houston to a $100 million deal, making him the highest-paid player in franchise history. While the move might have been made with the best intentions, it turned out to be disastrous for New York. After a career-best season in 2002-03, Houston missed more than 30 games the next season. In 2004-05, he was limited to just 20 games due to knee injuries. Houston was done in the NBA and managed to be the second-highest paid player in the league in both the 2006-07 and 2007-08 season despite effectively being retired. Houston’s contract led to the “Allan Houston rule” which gave NBA teams the chance to release a player without the contract counting against the luxury tax rule. The Knicks would use the exception on forward Jerome Williams. After failed comeback attempts, Houston eventually landed on his feet. Thanks to Knicks owner James Dolan, Houston is now the team’s assistant GM. In the summer of 2016, ridiculous money was thrown around thanks to a rising salary cap. One of the most head-scratching deals handed out was the Knicks giving Noah $72 million after he played 29 games the season before and didn’t play all that well. Noah had built a reputation as a defensive powerhouse, but his fragility was a concern, and his injury issues didn’t subside in New York. He played in just 46 games for the 31-win Knicks that year. And before the end of the season, Noah was suspended 20 games for violating the league’s anti-drug policy. Things didn’t get better the next season. After playing in just seven games off the bench, Noah got into a verbal altercation with head coach Jeff Hornacek and departed from the team. Just over two years after signing the deal, New York waived the Frenchman using the league’s stretch provision. By the end of Noah’s relationship with the Knicks, he was paid more than $1.3 million per game. That’s not a bad deal for him at all, but not a good one for the franchise.